Arroz caldong goto is well known as “goto” which means beef tripe but there are many kinds of dishes of beef tripe and I’m not sure why it is simply called goto and not arroz caldong goto. This recipe is made from rice soup or gruel with beef tripe and beef milkbags to add flavor. But since milkbags are not always available in the wet market, some use ox intestines which also add flavor to the dish. To cook arroz caldo; To prepare tripe and milkbags, boil in water over low heat until it can be pricked through by a fork. Use 1 gallon of water for every 1 kilo of tripe and 1/2 kilo of milkbags. This will be reduced to 1/2 gallon of soup stock. Set aside. Heat the cooking oil in a heavy pot or casserole pan. Add the ginger and cook till brown. Add the garlic and then the onions and cook till the onions are transparent. Add the patis, salt, and MSG. Add the uncooked rice. Turn the heat to low and simmer. Slowly add the soup stock. Lastly, add the tripe when the rice is half-cooked. Cook until rice is done. Serve as soup garnished with topping of crushed brown garlic and minced onion leaves. Accompany the dish with a slice of calamansi. To prepare tripe and milkbags, boil in water over low heat until it can be pricked through by a fork. Use 1 gallon of water for every 1 kilo of tripe and ½ kilo of milkbags. This will be reduced to ½ gallon of soup stock. Set aside. Heat the cooking oil in a heavy pot or casserole pan. Add the ginger and cook till brown. Add the garlic and then the onions and cook till the onions are transparent. Add the patis, salt, and MSG. Add the uncooked rice. Turn the heat to low and simmer. Slowly add the soup stock. Lastly, add the tripe when the rice is half-cooked. Cook until rice is done. Serve as soup garnished with topping of crushed brown garlic and minced onion leaves. Accompany the dish with a slice of calamansi. Good for 8-10 persons. 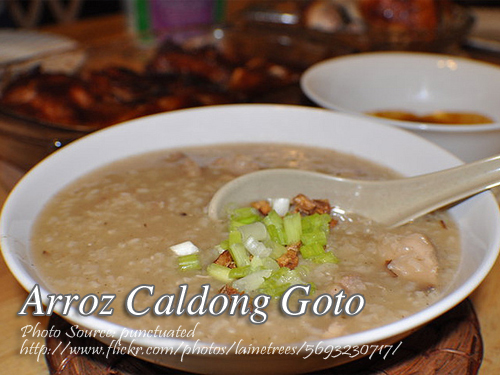 Very nice and tasty goto arroz caldo. I never thought milk bags are used in cooking this dish. Thanks!